Used MG MGTF Review - 2002-2005 | What Car? 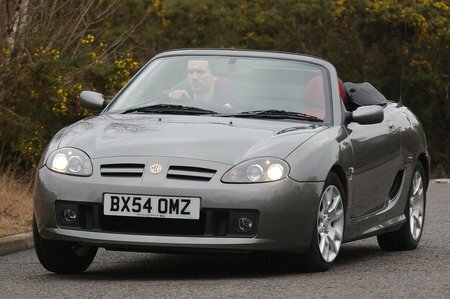 What's the used MG MGTF sports like? Although the MG TF is mid-engined, just like the Lotus Elise it shares its engines with, it feels much more like a hot hatch to drive than a trickier performance car. That's not to say the TF lacks performance, though. Its 1.6 and 1.8-litre engines have to be revved hard to give their best, but they thrive on it. The main problem for a keen driver is that the steering uses electric assistance and feels vague compared with a Mazda MX-5's, and the driving position is set too high. When MG turned the original MGF into this TF in 2002, it also redesigned the suspension and did away with the F's gas-filled suspension. This means the TF turns into corners a little more crisply than the F, but it doesn't ride as comfortably over poor surfaces. Generally, though, it's fairly comfy. When the roof's up, the TF is watertight and the hood seals out noise well enough.